Nunnykirk Centre for Dyslexia headteacher Barry Frost, left, and some pupils and staff celebrate the Ofsted report. Picture by Jane Coltman. There were plenty of positives for a Northumberland residential special school in a recently published Ofsted report. 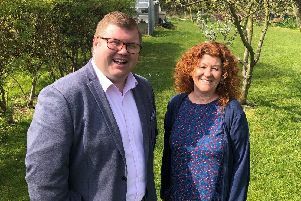 Inspectors visited Nunnykirk Centre for Dyslexia, which provides high-quality education and support for pupils aged between nine and 18 with dyslexia and associated learning difficulties, earlier this year. They gave the school a Good rating and its compliments in its report include the following. ‘Young people achieve academically and their emotional well-being is paramount. They are supported by a skilled, experienced staff team that encompasses both school and residential staff. ‘They learn a range of independent skills that prepare them for later life. The impact and effectiveness of leaders and managers and the level to which children and young people are protected were also highly praised. All of Nunnykirk’s youngsters rated the school, which provides fully supported optional boarding up to four nights a week, as a very good place to be and they are very positive about life in school. Nunnykirk Centre for Dyslexia occupies a large country house in a beautiful setting, a few miles west of Longhorsley. The grounds cover 12 acres and facilities include a go-kart track, tennis court, playing fields, ornamental and walled gardens and outdoor play areas. Headteacher Barry Frost said: “A strength of Nunnykirk is our very special, close community. Ofsted saw many examples of how ‘staff genuinely care about (pupils) and their well-being’. “The text of this report really recognises what we do and where we are going.